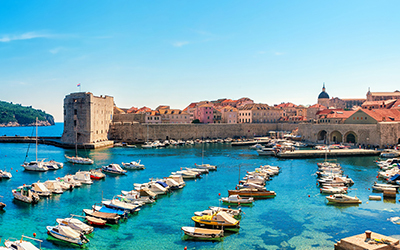 Welcome to Dubrovnik, a beautifully preserved Dalmatian town full of history. Immerse yourself in the rich culture and heritage of this charming destination, and with the help of your True Trips guide discover the best-kept secrets of the city and its surrounding areas. Wander the immaculately preserved, bastion encrusted, city walls that surround Dubrovnik’s historic center and are a UNESCO World Heritage site since 1979. Dubrovnik is a patchwork of Gothic, Baroque and Renaissance architecture and will leave you in awe with its beautiful buildings. 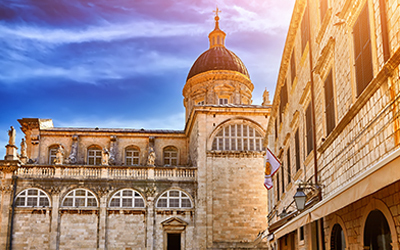 Follow your guide inside the city walls and explore the Rector’s Palace and Sponza Palace, the magnificent Cathedral of the Assumption, and the Franciscan monastery and museum. If you have enough time, you may like to hop on Dubrovnik’s cable car for one of the city’s most striking views – a mosaic of terracotta rooftops from the old town against a backdrop of deep blue sea. Covered with impressive vineyards and beautiful pine and cypress trees, Korcula is a stunningly lush Adriatic island. Having settled-in at your authentic boutique hotel, together with your True Trips private guide begin your exploration by visiting Korcula’s Old Town. Like most Dalmatian destinations, it is dominated by medieval walls and towers; journey through history and discover some of the Old Town’s impressive buildings including the famous Land Gate. Visit the 15th century Cathedral of St. Mark that boasts a stunning façade, an ornate bell tower, and two paintings by the renowned Venetian artist Tintoretto. If you’re a wine lover, then Korcula is an excellent place to sample some of Croatia’s best wines made from the indigenous pošip grapes. If you’re visiting during the summer then you’ll definitely want to see a performance of the Moreska, Korcula’s traditional sword dance, as well as enjoy some of the island’s best beaches including Luka Korculanska, Bacva Bay, and Lumbarda. Be sure to try some of the island’s delicious local dishes like Žrnovski makaruni, a traditional homemade pasta topped with delicious meat sauce. Korcula is a beautiful island that will be one of the highlights of your experience in Croatia. Welcome back to the pearl of the Adriatic! 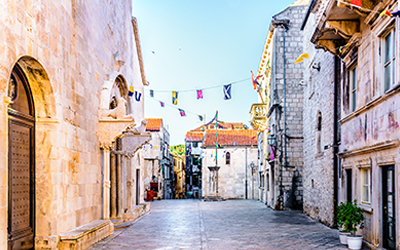 Having already explored the city during your first stay in Dubrovnik, we recommend taking it easy this time around and getting better acquainted with local life. Wander through the picturesque streets with elegant squares and admire the impressive architecture and baroque buildings, then do some shopping before enjoying a delicious al fresco lunch at one of the elegant seafood restaurants. If you find yourself with enough time, you may enjoy heading up to Srđ - the hill overlooking Dubrovnik – for a stunning panoramic view of the city and surrounding islands. Dubrovnik is a small piece of paradise on Earth that will keep you coming back for more!